This edge is very common in production knives for a simple reason. It minimizes stock reduction, ergo production cost. For the hand-craftsman this is the hardest grind to make. The flat is very small, so keeping steadily on it as you round a compound curve is exceptionally difficult. Not saying it can't be done, but it's not easy. The advantages of this blade are in chopping only... with a steep bevel (unless using very thin stock) this edge is my least favorite and sticks badly when chopping or slicing. 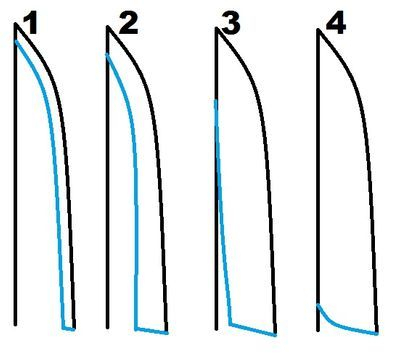 This edge is also very common in production knives, for the same reason stated above, but presents a less steep primary bevel which makes the blade a bit more utilitarian... Actually I would propose that this is the most common bevel in production blades. It's not quite as hard for the hand-craftsman as the Extreme Under-Ground edge but still presents a small flat to work on. This edge is a middle ground for chopping and slicing. The thicker spine being left gives the blade heft and a good chopping profile but the deeper bevel aids in slicing. The edge is ground very nearly to the spine but does not run out... This grind is seen in some production knives and may well be the most common for hand-crafted blades. The larger flat means more stock reduction for production makers but for the hand maker means a larger flat to work on and so it is easier for the hand craftsman to keep symmetrical. This is my personal favorite grind and is the best cutting profile, but depending on blade shape and taper may lack chopping power. This edge actually extends the plunge lines beyond the spine of the blade and the entire blade is beveled. Arguably this profile is the best for cutting, as it provides the least resistance... on the flip side I personally believe that this kind of blade creates a stress riser. When doing destructive testing, every Over-Ground blade I have tested has broken at the plunge. This is seen equally in both production and hand-crafted knives.